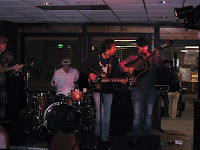 Every Wednesday night in January, Wispers Bar at Wisp Ski Resort is hosting live music by the Davisson Brothers Band. It is a FREE Show starting at 8pm. Last week, I was able to get out and have dinner and enjoy some music. 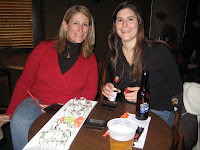 Wednesdays at Wisp you can also get great sushi and sit down and watch the band. Wispers was packed and the evening was fantastic. Good food, good company, and great music! For more information you can contact Wisp Resort at 301-387-4911. During the holiday madness, my husband and I were able to make it out to Pine Lodge Steakhouse for dinner. Centrally located in McHenry, Pine Lodge Steakhouse is not a far drive from any lake home. It has two dining areas, the upstairs dining area and the saloon downstairs with wax stone floors, wooden pillars, and a large horseshoe style bar. We choose the saloon, with the smoking ban in all restaurants in Maryland we were able to bring our 9 month old son with us as well (he chose crackers for dinner). We started out our dinner with the appetizer special, the mussels, which ended up being a fabulous option. Then we split their biggest steak on the menu, The Lumberjack – it exceeded our expectations (it was so big, we needed to take some home for lunch the next day). We had a fantastic meal and top notch service for under $55 at a very popular restaurant in Deep Creek Lake. They have great lunch specials and dining options for every taste bud. You can even make reservations online at http://www.dclfun.com/! Look forward to seeing you out and about in Deep Creek Lake!